Rantakylä Big Band was founded in the beginning of the nineties. Although the players are occupied in different professions, they all have a solid musical background. Music teacher Krystian Tesarczyk has led the orchestra from the beginning. Multi-instrumentalist Tesarczyk conducts other interesting ensembles as well, a.o. jazz choir Nova Singers, Miller Sound Orchestra, Tesar Jazz Band and the baroque orchestra Mondetta. The orchestra repertoire includes, besides traditional American big band music, also Finnish and Italian evergreens. The orchestra plays mainly in the area of Mikkeli district, but it has performed abroad, too. In the autumn of 1996 the band had a self-financed performance in Denmark. Rantakylä Big Band has co-operated with Mikkeli rural municipality, which also awarded the band with an art award in 1996. American-Finnish residents in Florida invited the band to play in Lake Worth in the autumn of 1997. In 1999 the band played at the Pope Pius IX School. In the autumn of 2001 the band headed for the historic city of Cracow, Poland. The band performed at the famous U Muniaka Jazz Club. In October 2002 it was time to play together with the artists at Semafor-theatre in Prague. Funds of this charity concert went to restauration of the flooddamaged theatre. In February 2003 Tesar Jazz Band played on Costa del Sol, Spain, an area favoured by tourists. The band had two concerts in Fuengirola at the Mai Tai club and one gospel concert in a church in Torremolinos. In October 2003 Tesar Jazz Band played concerts in Poland, again. The concerts were at the popular Jazz Café in Warsaw and in the old town Kalisz. In October 2005 the band visited Bratislava, the Capital of Slovakia. They had two gigs at the popular Jazz Café Club there. In October 2007 Rantakylä Big Band and Tesar Jazz Band visited Thailand, invited by the Ambassador of Finland, Mr. Lars Backström. The orchestra played at the Thailand Culture Centre in Bangkok. The concert was a part of the 80 year celebration of the King of Thailand. 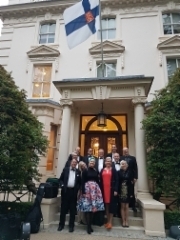 Another concert was played for international diplomats at the Finnish Ambassador’s Residence in Bangkok. in March 2010 band had a concert at the Finnish Ambassador's residence in the occasion of the 60th anniversary of diplomatic relations between Finland and China. in October 2012 Rantakylä Big band played two concerts at Toila Spa Hotel. in June 2013 band was invited to Beijing by the Ambassador of Finland, Mr. Lars Backström. The orchestra played two concerts: A Cultural Journey from Finland to Financial Street at the central square of Beijing Financial Street and a Farewell party for the Ambassador Lars Backström at the ambassadors recidence.